Nationwide, state and local governments continue to try to implement motorcycle-only checkpoints that target motorcyclists for inspection by law enforcement officers. Many of these motorcycle-only checkpoints are funded by grants from the federal government through the National Highway Traffic Safety Administration (NHTSA). Opponents argue that these motorcycle-only stops unfairly target and discriminate against motorcyclists. Advocates for the motorcycle checkpoints say that these stops are in the public’s best interest and designed to look for safety violations. As such, they allow for motorcyclists to be pulled over by law enforcement, even when they have violated no laws or rules of the road. One such Grant, in the amount of $70,000, was awarded to the State of Georgia. The Georgia Department of Public Safety stated that the motorcycle-only roadside checkpoints will be utilized to check for proper licensing, DOT helmets, alcohol usage, valid tags, as well the general operating condition of the motorcycle. New Hampshire legislators shot down the request for motorcycle-only stops and enacted legislation that specifically prohibits law enforcement agencies from accepting federal funding to establish motorcycle-only roadside checkpoints. 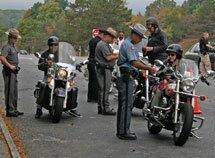 HB 148 (2011) Other states including Virginia and North Carolina have followed New Hampshire’s lead in precluding these types of motorcycle stops.